Hi, I am interested in your 2008 Porsche 911 Turbo Cabriolet (stock #19GKM35) listed on Autotrader for $104,900. I'd like to get more information about this vehicle and confirm its availability. (Please note: If you happen to be viewing this vehicle on a website other than our main website, its possible that only some of our many photographs of this car are presented due to website limitations. To be sure you access all the photographs, please go to our main website: Garage Kept Motors.) 2008 Porsche 911/997 Turbo Cabriolet - One of One 900hp SEMA Build Garage Kept Motors is pleased to offer this radical custom Porsche build by Auto Art of Chicago, IL for the 2016 SEMA Show. This is a one of one vehicle - you will not find another like it. Head to YouTube and search Auto Art 2016 SEMA Build: 2008 Porsche 911 and see/hear about the entire project. Here are the details: The sourced car was a low-milage 2008 Porsche 911/997 Turbo Convertible with an original MSRP of $147k. The car was originally black before Auto Art changed it a custom coined Chicago Steel, which is a phenomenal, high end paint finish. The interior was customized as well with awesome Carbon Fiber bucket seats fitted with black leather and houndstooth fabric. 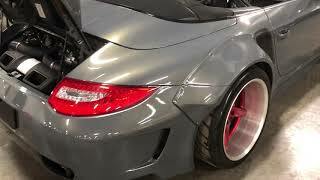 Auto Art used a full and authentic Liberty Walk Body Kit with a 997.2 rear end conversion. This baby is W-I-D-E. The body kit was one of kind, and was signed by Kato of Liberty Walk on the center console - the only car signed in 2016. This is just one of two Liberty Walk Turbo Cabs ever built. The wheels are Vossen x Work VWS-3s with Toyo R888R rubber with H and R Coilovers - the stance and rims compliment the build to perfection. On looks alone, this is a showstopper. But wait, theres more. Performance wise, this car is a monster, with an estimated 900hp in your command. It has the AMS Alpha 9 Turbo Kit that uses Bigger Turbos, Intercoolers, Larger Fuel Injectors, OE GT3 Throttle Body, IPD Intake Plenum, BMCC Air Filter, Boost Controller, Street and Track Tune, Capristo Valvetronic Exhaust System, and more. The exterior is loaded with customizations: Carbon Fiber Front Liberty Walk Lip, Carbon Fiber Rear Liberty Walk Diffuser, Custom GT2 Carbon Fiber Quarter Panel Air Ducts, Carbon Fiber Headlight Trim, and Carbon Fiber Mirror Trim Completely Refinished Steel Grey Gold Paint Scheme throughout. And the interior features even more: 911R Herring Bone Upholstery, Bolt in Roll Bar, Anodized Red Rennline Aluminum Floor Mats, Rennline Aluminum Pedal Set, Rennline Aluminum Floorboards, Rennline Fire Extinguisher Color Matched w/Martini Graphic Center Console, MA Carbon Alcantara Steering Wheel, and Ring Red Anodized Door Pulls. It also has 3M Crystalline Window Tint Completely Coated in C Quartz Finest Ceramic Coating. The car has been babied since SEMA with less than 1,500 miles added since the build. The car also comes with the GT Wing, which our client chose to remove per preference. It has had recent Rennline upper coilover mounts, transmission service, filter gasket fluid, all ignition coils and spark plugs, engine idler pulleys, and engine oil service. It has been cared for by a super car enthusiast and is offered here turn-key for its new owner. There is WAY more money invested in this car than the price offered here. A great opportunity to own a one-of-one 900hp Porsche at a reasonable price point. Be sure to check out all the photos and video on our main website: Garage Kept Motors. Call if interested or e-mail with any questions. Thank you for looking.